After a player (“you”) has opened the bidding there is the possibility that the player on your left, who is part of the opposing partnership, might overcall. When this happens it can sometimes mean that your partner has to bid at a higher level when making a change of suit response than they otherwise would have. North’s two spade response shows a holding of 9+ points and 5 or more spades. If West hadn’t made a two club overcall, partner could have responsed with 1 spade. The overcall has forced partner to bid at the two level. A change of suit response by partner is a forcing bid. As East has passed you are obliged to bid again even if you hold a relatively weak hand. We must bid again so bid our second suit, which we have no option but to bid at the three level. As the LHO’s responding bid forced your partner to bid their change of suit at the two level, your rebid at the three level (the lowest rebid you can make in the circumstances) doesn’t promise anything more than the minimum 12 points. You open 1 heart, LHO overcalls 2 Clubs, partner bids 2 spades, RHO passes. What do you bid? You have no stop in clubs, you are too weak for 1NT , your hearts are not great. Partner should have about 11+ points for his reply since the overcall has pushed the bidding up a level. Since you have game points between the 2 hands use a cue bid of 3C to get more information from partner. 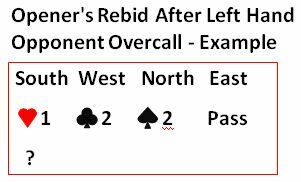 Partner will reply to further describe his hand e.g., 3NT with a stopper in clubs, 3S with 6+ spades, 3H with 3 hearts etc.